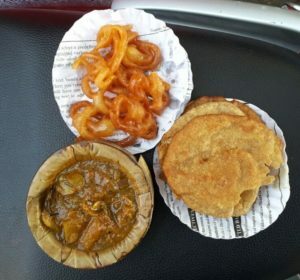 13 things you must eat in the holy city of Varanasi! - Must. Eat. World. I was born here, spent the first 18 years of my life here. The city has influenced me in ways that I can’t even begin to describe or fathom. But I know this for sure… this city is where I developed a taste for food. Amazing food! 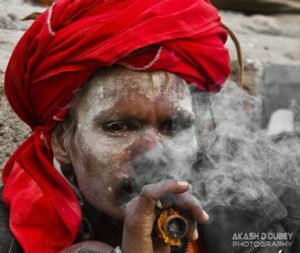 You’re probably coming to Banaras to check out all the temples, take a boat ride on the Ganges, hang with sadhus (and smoke a little something something), or discover yourself. Whatever your reason may be, the one thing that you can’t miss out on is the street food. 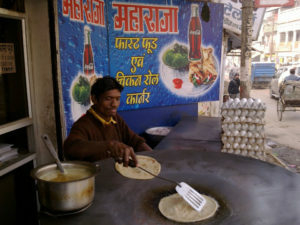 Banaras is one of the best street food cities in the world, and everyone (I mean literally everyone) here is a major foodie. Sadhu smoking a little something something! The amazing food mentioned in this post has been put together by all of my childhood friends,Thanks guys!! 😉 , both current residents of the holy city and many more who keep coming back, in no small part because of fantastic culinary experience that is our city. Yes, you can find chaat in every Indian city, but you will be hard pressed to beat the chaat scene in Banaras. 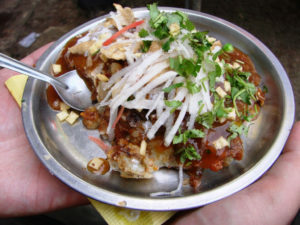 Go to Kashi Chaat Bhandaar in Gudowlia, Dena Chaat in Luxa or Banarasi Chaat in Lanka. 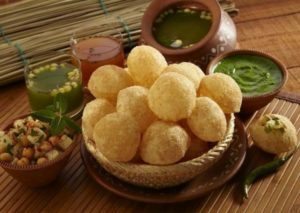 The three thing that you must try are, Tamatar (Tomato) Chaat, Alu tikki (Potato cutlet) and Golgappas (spicy water bombs). If you have any space left after this, you can experiment with many other chaat forms like Samosa (potato pastry) Chaat, Palak (Spinach) Chaat, Dahi Vada (Sweet and spicy yoghurt), the list goes on. Staple breakfast of deep fried indian bread with some spicy flavorful potato curry. Go to Chachi ki Kachowri (Aunty’s Kachorwi) shop in Lanka or Ram Bhandar in Kachowri Gali. (That’s right, the food is so gangsta they name the street is named after it). Get yours before 10am, they run out pretty fast. Right after you’ve had kachori sabji at one of these 2 locations above. Ask for some Jalebi. Deep fried pastry dipped in thick sugar syrup. Crispy sweet and delicious! Go for the double egg double chicken roll. The flaky bread stays together because of the the egg bonding. This Calcutta style roll is better than most of the rolls I’ve had in Calcutta. Absolutely delicious. This ain’t your simple lemon tea with subtle flavors. The added salts are an assault on your tastebuds. 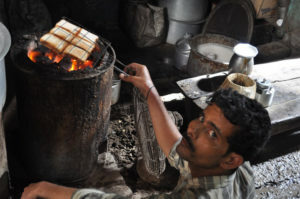 Some coal roasted bread with a dollop of salty Amul butter. Not good for your cholesterol levels, but so good for your taste buds. The chai is served in traditional terracotta cups (kulhar) that add an earthy flavor. Saffron-flavored sweet fluffy milk froth. Way fluffier than souffle. Only available in the winters and only in this city. Absolute must have. 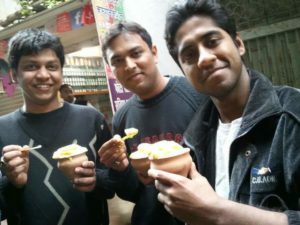 Tanay, Abhishek and Mahaan eating Malaiyo! 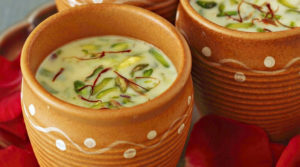 Thandai is a cold milk drink made with pistachios, almonds and saffron that is typically consumed during the festival of Holi with marijuana extract called bhaang (yes…highly intoxicating) or without. No reason to restrict consumption to the Holi celebration. You can have this anytime of the year. 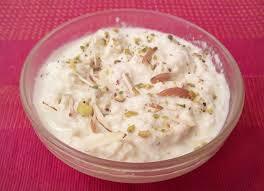 This is my all time favorite Indian sweet. Made from thickening milk with sugar over low heat for a long time. Simple ingredients but there is nothing like it. Banaras is home to some of the most amazing lassi (yoghurt drink) you will drink (let’s ignore the fact that Lassi is from Punjab ;)). 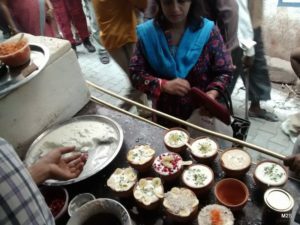 Go to Phalwan ki Lassi (in Lanka) for some traditional lassi, or check out Blue Lassi (Kachowri Gali Chowk) for some amazing flavored lassi (Mango, Banana, Chocolate, Coconut , Pomegranate and many more). Not so local but a local favorite. Dosa, Idli, Vada and Uttapam are the four most common South Indian dishes found in North India. This place has the best South Indian food in the city. Baked Eggplant, lentils and Baked Flour Balls. Super healthy and super good, this is an import from the neighboring state of Bihar. Started as a street food trend (in Lanka) the best place to have this now is the Baati Chokha Shop (in the Anand Cinema Complex). 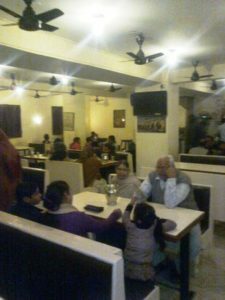 And finally I wanted to leave you with a list of restaurants that are worth trying out even if these places aren’t all that Banarasi. 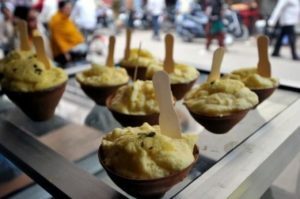 Great food aside, Banaras can be an assault on your senses. The city is the epitome and amplification of the chaos and cacophony that is India. Life here blends seamlessly with death. Not everyone’s cup of tea. If you find yourself lost in the all the chaos, take a deep breath and head to the next tea stall and relax. You will find your way. That’s why you come to Banaras in the first place. To find your way! Banaras is different things for different people. 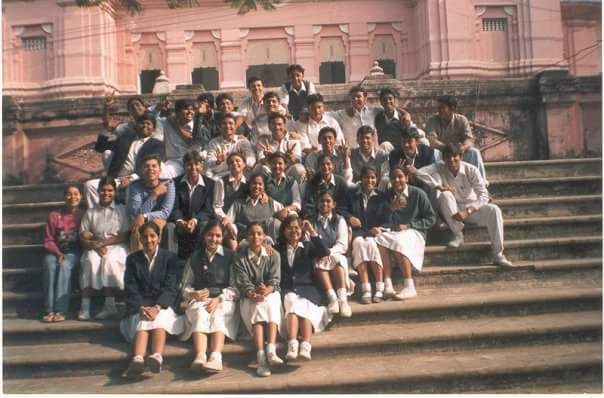 For me and my friends that grew up here Banaras is just home. There! You had to make me cry. I love this article. I really do. And I miss home… I really do. Well done Anant. This was brilliant. I am sharing like mad. Love you tons. 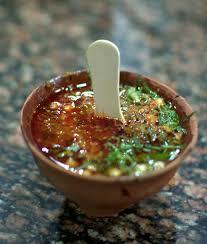 Really it all are delicious….i miss it badly… because banaras jaisi chaat kahi bhi nhi…. I love my city banaras….i miss it badly…. great work Ananat ji….. Thanks, it reminded me all the sweet memories of my town….where i had born and grown up..awesome place to live in…Do miss it. Great things u reminded, was born & brought up there 8 years, then within 45 years have visited Varanasi more than 50 times. 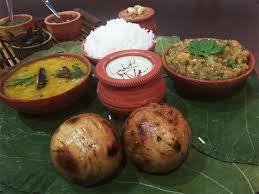 Love those foods, its beauty & many more. Thanks for the article. India tour july 2016-i love the holy city!